Exactly 70 years ago the Constituent Assembly of India sat for the first time on December 9, 1946. Thus started a historical journey which saw India attainting independence, deciding on its national flag, national insignia, national anthem; and ultimately adoption of the Constitution which made our country a democratic republic. On this occasion, Down to Earth is putting together a special package in collaboration with Jana Vidhi Muhim, which is working on spreading constitutional literacy; especially on countering ignorance and misinformation. It is desirable that Constitution becomes accessible by common citizen and doesn’t just remain preserve of lawyers and scholars. We present this package with a hope that more and more people will realise that the Constitution is not a holy book but a functional manual. The Constituent Assembly of India came into existence as per the provisions of Cabinet Mission Plan of May 1946. Its task was to formulate constitution/s for facilitating appropriate transfer of sovereign power from British authorities to Indian hands. The Assembly was to have proportional representation from existing provincial legislatures and from various princely states. Bulk of these elections was completed by the end of July 1946, under the supervision of Reforms Office under Governor General (Viceroy). The Assembly was to have three sections: Punjab & North-West, Bengal-Assam and Rest of India. 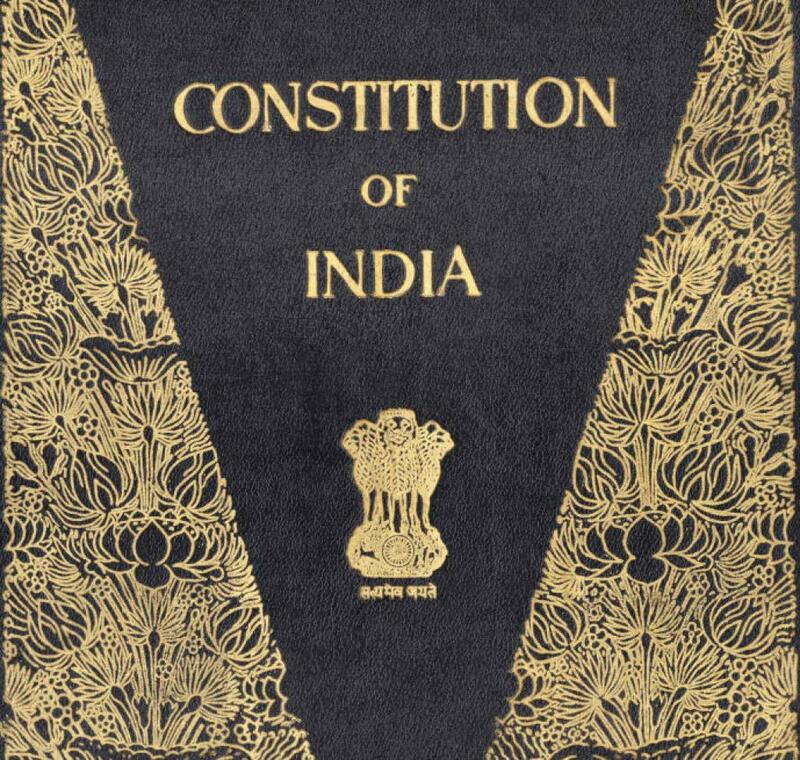 The Constitutions were to be formulated for Indian Union, each Section and for each of the Provinces therein. The Muslim League, which had won bulk of the 80 Muslim seats and dominated two smaller Sections, chose not to participate so the Assembly never convened separately in sections. Membership of the Assembly kept varying for different reasons, other than resignation and death. Many public figures showed keenness to enter the Assembly but its membership was also denounced by certain groups like Muslim League, Communists and Socialists. These attitudes changed too. After passage of the Indian Independence Act by British Parliament it was decided that those members who wish to retain their seats in provincial legislature would vacate their seats in the Assembly. But several members of provincial legislature continued to come and partake in the Assembly until the provision against this was made in the Constitution itself. Biggest change in membership was caused by the declaration of Partition of India. Certain members like Dr. Ambedkar, who were elected from territories assigned to Dominion of Pakistan, lost their seats. Muslim League members elected from United Provinces, Bihar and elsewhere came to occupy their seats after partition. Such members were humiliated on many occasions and Patel even told them to go to Pakistan. After initial disinterest, the princely states started negotiating with a committee of the Assembly for their representation. Over a period, hundreds of princely states were grouped into larger associations and provisions were made for them to elect their representatives to the Assembly. Till the last day of the Assembly, new members kept joining in. Hyderabad did not send any representative till the end. The total number of people who sat as members of the Assembly at any time has not been calculated by any official or scholar. Records show that maximum membership towards the end of tenure of Assembly was 307. The Assembly took help of several non-members in formulation of the Constitution. Eminent public figures outside the Assembly were requested to work as members of committees formed by the Assembly for focused deliberations on specific features or segments. Much of constitution-making took place in these committees, both from procedural and substantive viewpoint. Till date, no official report has appeared in public domain on the exact number of committees formed by the Constituent Assembly. Resolutions were moved for setting up committees as and when the need arose, and adopted after discussion. Depending on swiftness of nomination or election of members of respective committees, their formal appointment took few hours, days or weeks from the adoption of resolution. 1.4- Credentials Committee (appointed on December 23, 1946. 5 members, Chairperson- A.K. Ayyar. Worked till the end. Curiously, the so-called Special Committee was constituted to decide the future course of action after comments had arrived in response to the Draft Constitution of February 1948. Neither a resolution for its constitution existed, nor anybody cared to inform the Assembly later on how and why this committee of great consequence was formed. In all, 32 members attended meetings of Special Committee on April 10-11, 1948, which were chaired by JL Nehru. Rajendra Prasad was the elected President of Constituent Assembly while VT Krishnamachari and HC Mookerji served as Vice-Presidents. HVR Iyengar was the secretary general of the Assembly, and SN Mukherji was the Chief Draftsman. After authentication of copies of the Constitution, the Constituent Assembly got naturally dissolved with its Chairperson having been elected the President of India, and its staff diverted to other avenues. But bulk of the Assembly continued functioning as provisional Parliament of India till first general elections were held. Indeed the first amendment to the Constitution of India was made by this provisional Parliament in the summer of 1951. Making of Constitution has been a controversial issue for a long time. This controversy consumes much public energy that can better be utilised in improving our collective understanding of the Constitution. Many experts have written dedicated books on making of constitution but a simplified brief on incremental stages of its formulation was missing. B N Rau was appointed Constitutional Advisor by the-then Viceroy Lord Wavell to head the Constituent Assembly Secretariat sometime in late July 1946. He had retired from civil service in January 1944 but remained active. He offered his honorary services to the Viceroy, which was accepted most probably due to his stint in Reforms Office soon after the enactment of Govt. of India Act, 1935. Rau prepared number of pamphlets on various aspects of impending constitution and also collected text of some important constitutions of the world, to facilitate informed discussion by the members of Assembly. Jawaharlal Nehru, as vice-president of Viceroy’s Executive Council, approved dissemination of these briefs on September 16, 1946. Later on, Rau also circulated focused questionnaire on certain aspects of federal constitution in March 1947, and focused Notes to various committees on occasion. Based on responses to his briefs and questionnaire, Rau prepared his Memorandum which included blueprints of probable provisions of impending constitution. Certain members chose to send their own individual notes which were to be placed before committees of the Assembly. In the second session of Assembly, its Chairman constituted four principal committees: Advisory Committee on Fundamental Rights, Minorities and Tribal Areas & Excluded Areas, Provincial Constitution Committee, Union Constitution Committee and Union Powers Committee. Of these committees, first two were chaired by Sardar Vallabhbhai Patel while the latter two were chaired by Nehru. Most of these committees appointed their sub-committees for more focused work on particular segment. Two or three of these committees also sat jointly to consider matters lying in overlapping zones of consideration. These committees finished bulk of their work by August 1947, but work of first committee went on for a long time on account of concerns of minorities. Partition is often cited as an excuse for delay but the crucial declaration was made on June 3, 1947 while these principal committees were tasked to finish their work by April-May 1947 itself. Anyway, their reports to Assembly included draft provisions of the constitution and some explanatory notes. Usually, the chairperson of the respective committee submitted the report to the President of Assembly, as also presented it in the Assembly and explained or defended it. The Assembly discussed the reports of principal committees in detail and adopted the principles therein. More than two thirds of the final constitution Bill was covered in these discussions. Constitutional Advisor started putting together first draft of constitution by aligning the reports already discussed and adopted. He also augmented it by filling obvious gaps himself in the form of suggestions, or indicated certain spaces that would only be filled after reports of sectoral committees came in. This was the stage of first major delay in completion of work since the first draft missed the deadline of August-September and arrived only on October 27, 1947. Various sectoral committees commenced and finished their deliberations, and this activity went on over a long period. These sectoral committees were assigned very definite tasks either by the Chairman of Assembly or by one of the committees itself. Many of these reports couldn’t be utilised in the first draft of constitutional advisor or in the Draft Constitution, and were incorporated in later stages. Assembly had resolved in July 1947 to constitute a drafting committee which will attune the constitution Bill from the perspective of legislative language and other such aspects. On August 29, 1947 this drafting committee was elected by the Assembly, while the committee chose its Chairman in its first meeting. Primary contribution of drafting committee was refining and expanding the draft of constitutional advisor (240 Articles, 13 Schedules) in its sitting held almost continuously. It produced the draft constitution by February 21, 1948 which contained 315 Articles and 8 Schedules. It was published on February 26 and circulated widely among official and non-official circles, to elicit comments. This was second major stage of delay in formulation of constitution since it was supposed to finish its work in a month and Dr. Ambedkar even informed midway through this round of sittings that assigned work would be finished within December 1947. Responses were invited on draft constitution by March 22, 1948. Soon, thereafter, the drafting committee sat down to consider these responses as presented by the assembly secretariat. Recommendations emanating from these sittings were duly forwarded to the Chairman of Assembly. Chairman of Assembly decided that responses on draft constitution and recommendations of drafting committee should be considered by a Special Committee, which was to consist of members of Committees on Union Powers, Union Constitution and Provincial Constitution. Nehru chaired the sittings attended by some 30 members. This Committee resolved some matters and held over some of them for later consideration. It recommended that call for amendments from members of Assembly may be issued. This Committee was supposed to reconvene on May 11, 1948 but apparently, it never did. It remains a mystery, unanswered by any participant or scholar, as to what caused the official inactivity on formulation of Constitution for six long months. Finally on October 18, 1948 the drafting committee picked the cue and decided in its sittings over three days that a reprint of draft constitution will be issued containing the amendments that the committee was willing to sponsor, parallel to relevant Article or Schedule. Approach taken at these two stages ensured that the Assembly would have to go through discussion and voting again and again on several segments. Lack of clarity and interest shown by Nehru and Patel in this phase expanded the role and authority of the Drafting Committee. Neither of the two de-facto leaders of the Assembly came forward to get a proper second draft prepared and to steer it in the Assembly. As per the resolution of the drafting committee, a reprint of draft constitution was issued to all members of the Assembly. Critique of the rationale behind this strange draft has been consistently avoided, and thus, it remains out of print despite the fact that the Assembly considered this version and not the oft-cited Draft Constitution of February 1948. Simultaneously, the President of the Assembly ensured printing and distribution of bound volumes of amendments proposed by individual members. During the course of debates in the Assembly, amendments were referred to by sequential number and book number. Since the Assembly was dominated by representatives from the Congress, party whip played a great role. However, certain individual members did express their views in Assembly, even at the risk of challenging the party whip. The Assembly Party meetings were open to non-congressmen who cared to attend. The Party took care not to enforce strict discipline on emotional issues and allowed open discussion in the Assembly, though in the end final decision on almost every segment of constitution was taken herein. The Constitution Bill being such a bulky document, the party whip issued to all members mimeographed lists of Articles and the decisions taken thereon. Most visible part of constitution-making was the year-long discussions in Assembly. For official purposes, this was called the first-reading. The discussion wasn’t always conducted in sequential order that articles were arranged in the draft constitution but was decided by the Steering Committee. Very few unofficial amendments were accepted by the Assembly at the voting. Even if they are not withdrawn, they were often negated. Some of the unofficial amendments were accepted by the Drafting Committee during discussion and thus, they were not voted upon. KM Munshi played a crucial role of a regular link between the Drafting Committee and the Congress Assembly Party. Discussion in the Assembly was rather haphazard insofar not being in sequential order of the Draft Constitution. Several matters, already decided after discussion and voting, were revisited for deliberations and often, changes of drafting nature were left to the Drafting Committee. It was obvious that a clean draft was required and therefore, the Drafting Committee submitted such a draft. In doing so, certain unapproved changes were introduced by the committee which required deliberation and decision of the Assembly. Individual members received it around November 6, 1949 and were given opportunity to propose amendments to these new changes. Officially called the second-reading of constitution Bill, this phase witnessed 170 amendments being moved. Only 88 were accepted, 30 withdrawn and 52 negated. With this, the real work of formulation of Constitution got over. This was a beginning of a largely ceremonial phase, officially called third-reading. In the discussion that ensued, most of the speakers (more than 100) explain their take on merits and shortcomings of the Constitution. Dr Ambedkar and the President of the Assembly gave their views in the end. With the last voting on the Constitution, it was adopted by the Constituent Assembly. The President of the Assembly signed a copy of the Constitution to officially bring it in force, although partially, because only 16 of the 395 Articles came into force at that point in time. Proceedings of the day began by the declaration of the President of the Assembly having been elected as the President of India. Then, all members signed three copies, the English print version and calligraphed version in English and Hindi, of the Constitution. 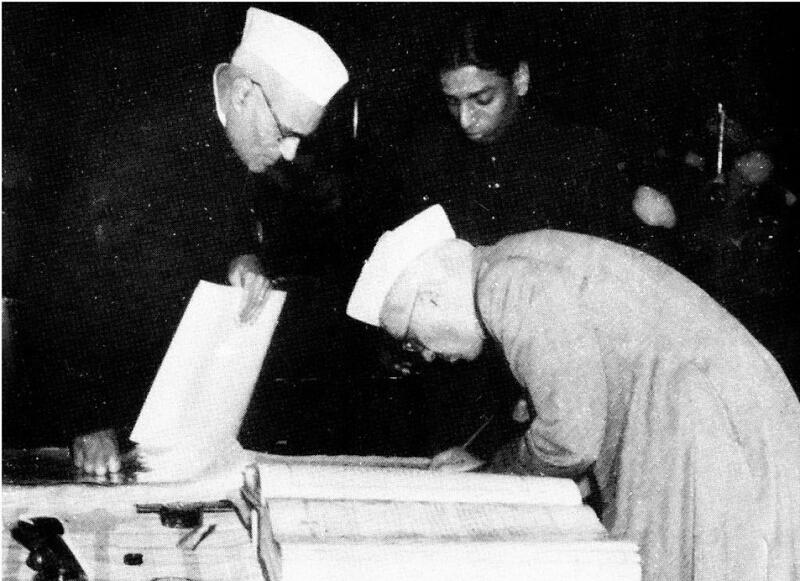 Nehru was the first and Prasad was the last to sign these copies. As per the provisions in the Constitution, it formally commenced on January 1950, bringing it in force in its entirety. This date was most probably chosen to commemorate the declaration of ‘Poorna Swaraj’ (Total Independence) by Nehru at an annual session of the Congress in Lahore in 1929. This day was used to be celebrated as Independence Day by the Congress for many years but circumstances (and the sudden decision of British authorities to grant independence) made it Republic Day.